GEOFF HUNT, PPRSMA - The full collection of limited edition prints and remarques. What is a remarque? We explain. Geoff Hunt is one of the world’s finest painters of 18th and 19th century ships. 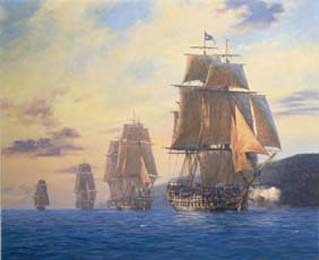 Through his research for paintings he is a leading authority on naval history and ship architecture of the period and has a special interest in the ships and commands of Lord Nelson. Geoff Hunt’s marine art features on the covers of Patrick O’Brian’s Aubrey-Maturin books, vividly evoking the atmosphere of ‘the best historical novels ever written’ (The New York Times). Subjects include HMS Surprise, fictionally commanded by O’Brian’s famous hero Jack Aubrey in the Oscar winning film ‘Master and Commander: Far Side of the World’ starring Russell Crowe. All prints are produced to the highest standards of art print publishing. The stunning full-colour images are printed on finest grade heavy art paper using light-fast inks. Prints are supplied unframed to allow your choice of presentation. An artist-remarqued print is a limited edition print, which in addition to being signed and numbered by the artist, also carries a small original pencil drawing. Only about a tenth of an edition is devoted to remarques, which are restricted to the prints with the highest numbers within the edition. The subject of the drawing is usually derived from the subject of the print. All drawings are signed by the artist with his initials. Of course, each drawing is entirely original and so each remarque is unique. Most of Geoff Hunt’s work is created to commission but occasionally there is a piece for sale from the studio and details are posted on this site. An oil painting can be commissioned from Geoff through Art Marine – please email jt@artmarine.co.uk for details. Typically a client will suggest and discuss a number of possible subjects with the artist and a formal contract is then drawn up. Geoff Hunt was President of Britain’s prestigious Royal Society of Marine Artists (RSMA) between 2003 and 2008. The RSMA is a charitable organisation which promotes marine art painting, drawing, sculpture and printmaking of the highest standard. The copyrights to the images appearing in Art Marine are the property of their respective owners and may not be reproduced or used in any other way without express permission.